Police in Mexico have detained two men suspected of involvement in the murder of Malcolm Shabazz, the grandson of US political activist Malcolm X. The suspects work at the bar where Mr Shabazz, 29, was beaten on 9 May 2013. He was found with fatal wounds in Plaza Garibaldi, a popular tourist area packed with bars and restaurants, and taken to a Mexico City hospital, where he died of his injuries a day later. Police said they were still searching for three more suspects. The two detainees have been charged with murder and robbery. All five suspects work at The Palace Bar, where Malcolm Shabazz was beaten. Miguel Suarez, a union activist who was travelling with Malcolm Shabazz, said they had been in Mexico as part of their efforts to advocate more rights for Mexican construction workers in the United States. Mr Suarez said he and Malcolm Shabazz had been invited to a bar on Wednesday night by a woman. The bar owner later demanded they pay $1,200 (£780) for drinks and female companionship, according to Mr Suarez. He said he had escaped as a fight broke out, before returning to find his friend seriously injured on the ground outside the bar. Mr Suarez said he had taken him to a hospital where he died of "blunt-force injuries". 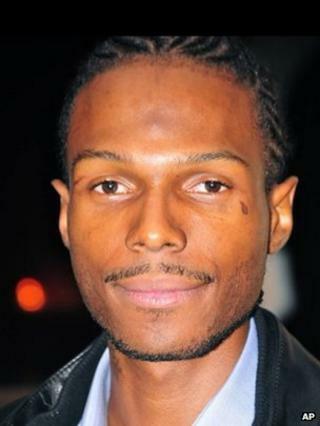 Malcolm Shabazz was the son of one of Malcolm X's six daughters, Qubilah Shabazz. When he was 12, he was involved in a fire that killed his grandmother, Betty Shabazz, the widow of Malcolm X. Convicted of manslaughter and arson, he was sentenced to time in a juvenile detention centre. Malcolm X was a black power activist and leader in the Nation of Islam movement. Late in his life he split from the group and converted to orthodox Islam. He was shot dead at a political rally in New York on 21 February 1965.